It’s been a while since we announced that our readers are now able to put questions to Simon Greenberg, the clubs Communications and Public Affairs Director. Since then, much has happened and lots changed at Chelsea, not least the management. Naturally a lot of the questions sent in related to the departure of Jose Mourinho, and what direction the club is headed in. We put forward ten questions that we felt best represented those asked by our readers to put to the club, and as with our magazine interview with Simon, he had no editorial control over the nature of the questions and nothing was off the agenda. Simon, when is Roman going to address the supporters of the club, and if he will not, then why not? So much is said in his name without ever having the benefit of hearing from him directly. Do we, the loyal supporters and ‘customers’ of Chelsea FC not deserve to know what his plans are for the club we’ve followed long before he came, and will follow long afterwards? At the right time Roman will engage with our supporters. We have discussed this several times internally and I think it is an important issue. Fan engagement is very high on his and our list of priorities for what we do as a club. My own opinion, personally and professionally, is that any public engagement from him must be done at the most important times and to have the maximum impact, otherwise it loses its effect. The other issue here is that Roman does not court publicity, is not comfortable with it and with English not being his native language he is concerned about delivering his message in the correct way, with the correct meaning and emphasis. It is absolutely right that our supporters deserve to hear from him, that you will be here long after we have all departed and that we are custodians of your club. That is why it is important to hear from him at key times, when those plans for the future are properly formulated. In the past he has made public statements about the takeover itself, wrote the foreword for the Official History of Chelsea during the Centenary and so forth. These are great landmarks in the club’s history. So in the future an appropriate time may be around the 5th anniversary of his takeover, or when we have firm plans for stadium redevelopment. I use these as examples of when might be the best time; no decisions have been made on this. Lastly we did seriously consider him engaging around the departure of Jose. Clearly this was an important event in the club’s recent history. But we decided against in the end as, no matter how successful Jose had been, a change of manager is really the board’s responsibility as it manages the day to day relationship with the manager, through Peter Kenyon. Also it is important not to forget that the board speaks for Roman, he has two direct representatives on it in Bruce Buck and Eugene Tenenbaum and he is clearly aware of all major decisions. It’s been written in many places Roman won’t be happy unless we’re playing attacking football. Is that true? Does the owner have any influence on the style of play or is it totally in the manager’s hands? It’s no secret that the style of football and the evolution of the team was a subject of debate internally amongst all the key personnel, but that does not mean directives are handed down from above. 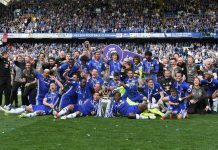 Roman and the board want to see sustained success for Chelsea and we would all prefer to see that done in an attractive, stylish way. Is there anything wrong with that? I don’t think so. But it won’t be at the expense of winning, the manager is not told to play a certain way and you can’t play stylish football all the time. I’m sure our fans understand that and want the same. Reading the article in the Guardian comparing Roman to Hitler and Stalin – what is the clubs policy on such defamatory journalism? In this particular instance did they pursue anything with the Guardian? Club policy on defamatory journalism is very straightforward. Libel and defamation is a notoriously difficult subject and we only fight those battles that we have a high confidence level of winning. You also have to weigh up the amount of time that goes into these things, the impact of the article, its prominence and so forth. Most big football clubs could probably spend the majority of the week fighting libel actions but is this a productive way to spend a lot of time? Probably not. So we pick and choose which ones to fight, and in this case, as distasteful as it was, we decided against it. An article like this hasn’t set the agenda for others and frankly any reasonable person would dismiss such comparisons as totally ludicrous. We also pursue factually inaccurate articles, not just libelous ones. Again you have to pick and choose which ones to fight but it is important to put a marker down occasionally to let the media know that we are not a punch-bag and that they cannot present rumour and innuendo as fact as a matter of course. Why did the club and Jose part company? During the press conference it was said that Jose’s departure was not planned and that a successful businessman like Roman does not make decisions on a whim, surely a contradiction in terms? Was it planned or not? There is no contradiction and I don’t really think we need to revisit why Jose left as we were totally open about the reasons in our statements and press conference. I think our honesty in that was confirmed by Jose himself when he spoke. It was the right thing for both parties. We did not plan his departure weeks ahead but at the same time it wasn’t done on a whim. Things are just not that black and white. Events developed fairly quickly but within that timeframe you have to plan, even in your own mind, about how things could pan out in different scenarios. I understand why the fans want to know more about his departure but I really think we need to leave it behind now and get behind Avram. Could you tell us why senior players at the club were seemingly gagged in the wake of Jose Mourinho’s departure from the club? Nobody was gagged. I am afraid that was another fiction by a particular journalist who has recently had to apologise to John Terry. Actually what happened not long after Jose left is that the players didn’t want to say anything immediately. They wanted to take events in, consider their response and talk at the right time. That was an entirely sensible approach. I discussed it with John and he felt that way, so did other players and that was fine with me. It was the players’ choice if they wanted to speak or not. Why is Avram Grant described as “Chief Coach” in the programme rather than “Manager”? If he isn’t the Chelsea manager then who is? Or do we now not have one? Initially Avram was appointed First Team Coach, he was never described as “Chief Coach”. This was because of the work permit he was given as Director of Football. We needed to make some routine applications to get this changed to Manager/First Team Coach, and this has now been done. Do you think the club are represented in the media as they would wish to be? If not, what measures are the club taking to counteract that? I think sometimes we are represented as we want to be and sometimes not. At the moment we are represented pretty well, results are good and nearly all of the major articles are about good results, good style of football, Avram doing a good job and so on. That’s great for me and my team, players want to speak about how they are enjoying themselves on the field and that makes our life easier because we can provide good, positive content for the media. Of course there is some speculation and still the occasional “political” story. I think increasingly the media are coming round to Roman being here for the very long term and being totally committed. But we work hard to create as many positive references as possible and for the media to give us a fair hearing. That’s all we ask for, a fair and balanced hearing. I don’t think we are there yet but maybe we are beginning to turn the corner. A poll on our site about rumours this summer found the Daily Star (oddly!) to be the most accurate, with 40% of their rumours/gossip proved correct. What do you think that says about the accuracy of media stories regarding Chelsea? I am surprised it is that high! Speculation is inevitable in football and even more so at the highest level where we now are. There are so many people who want a bit of Chelsea who are not part of the club, agents, lawyers, PR’s who have something to push, and the easiest way to do that is to link it to Chelsea. That maybe unfair, that maybe frustrating, but it’s life and if you let it worry you too much you’d go mad. Why was Paul Smith sacked in the summer, and has a replacement been brought in? If so, who is it and what is their scope of work? If not, why was he around for 3 years in a role which wasn’t needed? Paul had a certain skill set that was appropriate for Chelsea for a particular period in the club’s development. He is not being directly replaced and his responsibilities are being split between Ron Gourlay from a day to day business perspective, and me from a publishing and new media perspective. Peter Kenyon will still be heading the major thrust of our marketing such as the relationships with Samsung and adidas. What we have done is significantly strengthen the marketing department at a senior management level with some fairly recent and excellent appointments and we are sure that is the right direction for the business as we manage our current relationships and look to build new ones. Why has Neil Barnett been banned from Cobham? I am happy to answer in a general sense as I am sure your readers can appreciate that the details of individual employer/employee relationships are a private and confidential matter. One thing I can say for certain is that no one has been banned from anywhere. And contrary to what has been written in certain media the change has had nothing to do with me not liking the tone of certain questions and so forth. But we certainly felt that it was time for a change of personnel at the training ground to give other people a chance to express themselves and become a more regular fixture on Chelsea TV. Change and evolution has to take place. Neil has a certain knowledge of Chelsea and expertise that is valued but it was time for things to evolve in another direction.